So much of what happens in a great homeschool takes place in the kitchen. Of course, you may already have your schoolroom, and/or a living room where everyone reads together, and various other places where learning takes place. In our book The Phases of Learning we outlined a number of other TJEd appliances for every home, including the TJEd-style Bookshelf, the TJEd-style Closet, and so on. But somehow we never made the kitchen a key part of that—or any other—book. We did outline 55 Ingredients for a great homeschool, but we didn’t focus on the important role a kitchen can play. It’s time to change that oversight, right now. Why the Kitchen? The Heat! If you want to heat things up, get in the kitchen. In our experience, this is absolutely true! The amazing “heat” in the TJEd Kitchen transfers energy in several powerful ways. With convection, warmer air rises, while cooler air falls. 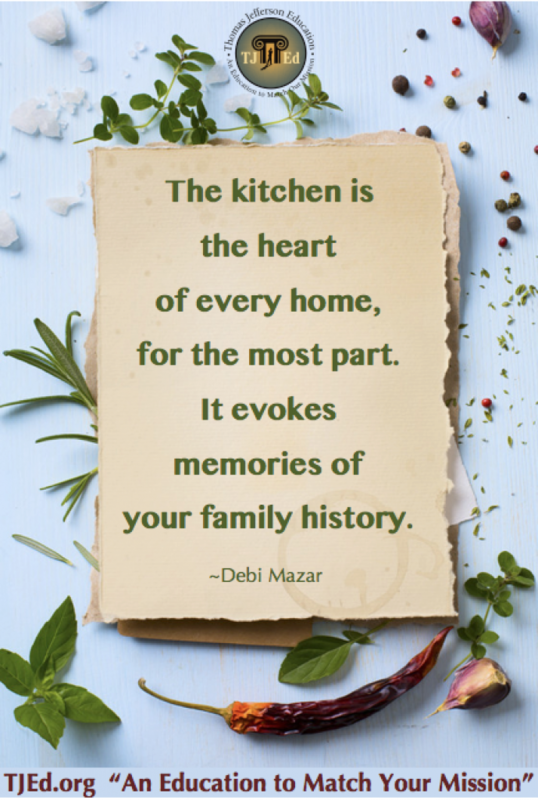 In the TJEd sense of the heat, time spent in the kitchen together – preparing meals, washing dishes, things we do several times each day – can create memories, bonds and moments where the high-value experiences rise and the harder or lower-value things become less front-and-center in our relationships, experiences and learning. Great ideas rise. Great conversations rise. Great moments rise. With conduction in the TJEd Kitchen, the “Heat” is transferred from one to another. The love, interests, curiosity, humility, courage, gratitude and more of one person can be shared by direct contact in the kitchen. Radiation is the heat we feel emanating from a source. 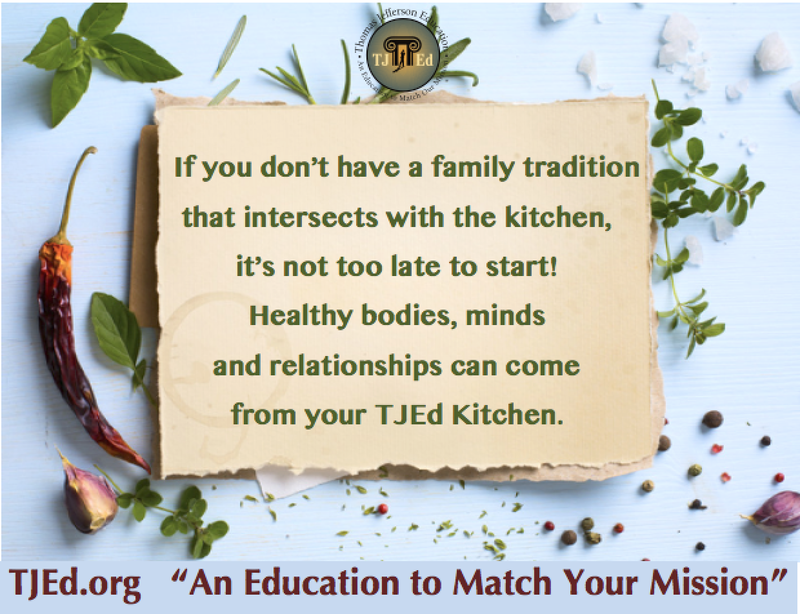 In the TJEd Kitchen, the parents in particular can emanate the “Heat”: a passion for learning, an interest in a variety of subjects and skills, a character that is pure and kind, etc. And everyone can have an opportunity to share their warmth in this way, being a source of “Heat” that others can be warmed by as the dynamic needs of the family ebb, flow and change. Heat promotes movement on a deep level. 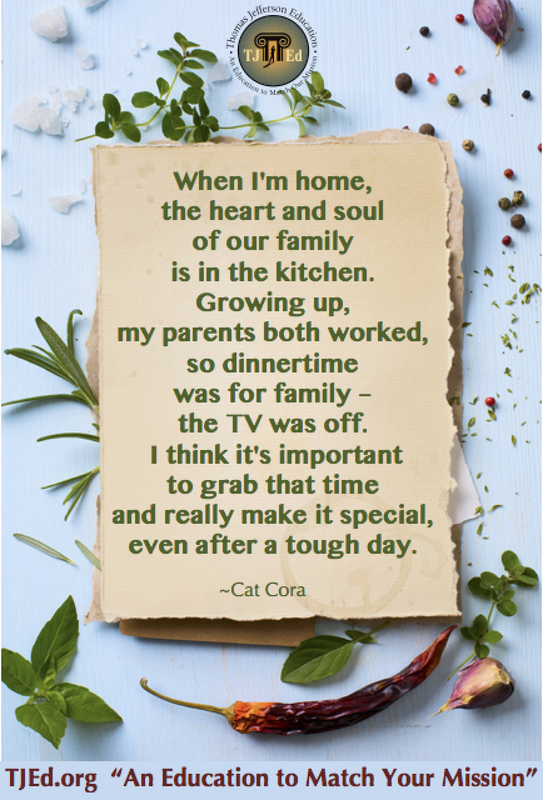 When the kitchen becomes a hub of activity (not just for cleaning or getting food onto plates) it can become a heartbeat in the home. It generates a “heat” that forges bonds, animates deeper thinking and sharing, and facilitates the transfer of ideas, values, experiences and vision. But the connection goes far deeper. The truth is, as important as reading and studying are to a quality education, there is something even more central. Something even more at the core of great learning. This something is simple: Conversation. Dialogue. Discussion. And it makes a huge improvement in any home or educational setting: chatting, listening, and just plain talking about things. The quality of your discussions with the children and youth you mentor has a direct, lasting, powerful influence on how much they learn, how much they like to learn, and how much they actually want to learn. 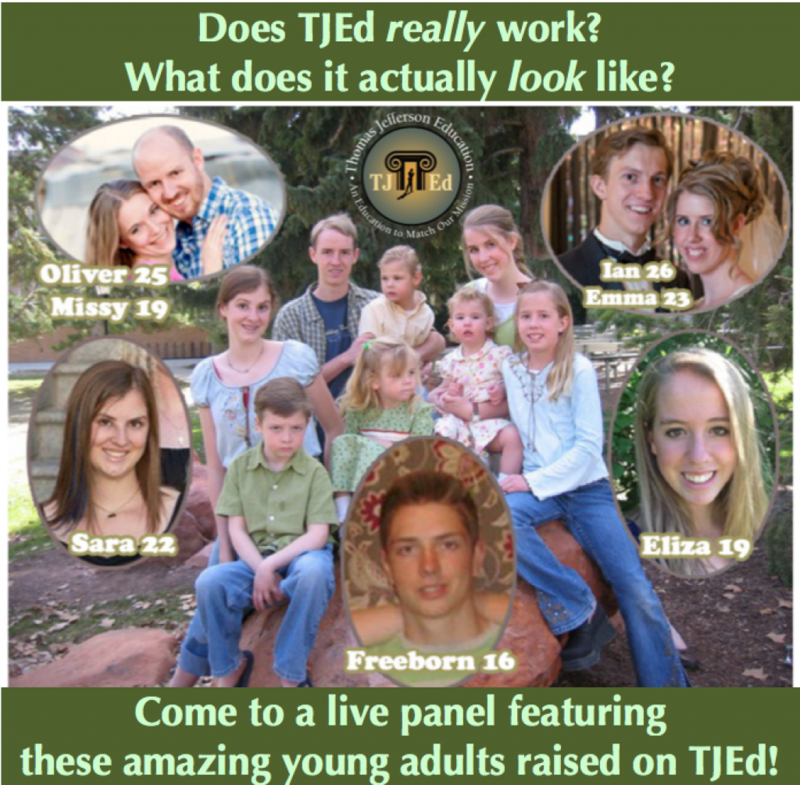 Conversations and dialogues are a key part of any excellent education, and for homeschoolers this means that at least one (and preferably two) of the parents are actively engaged in ongoing discussions with every child and youth. This may all sound obvious, but too often it falls by the wayside in the busy modern lives of most families. Parents who spark a lot of conversations with each child are going to see learning occur at a much higher level than those who don’t. Period. 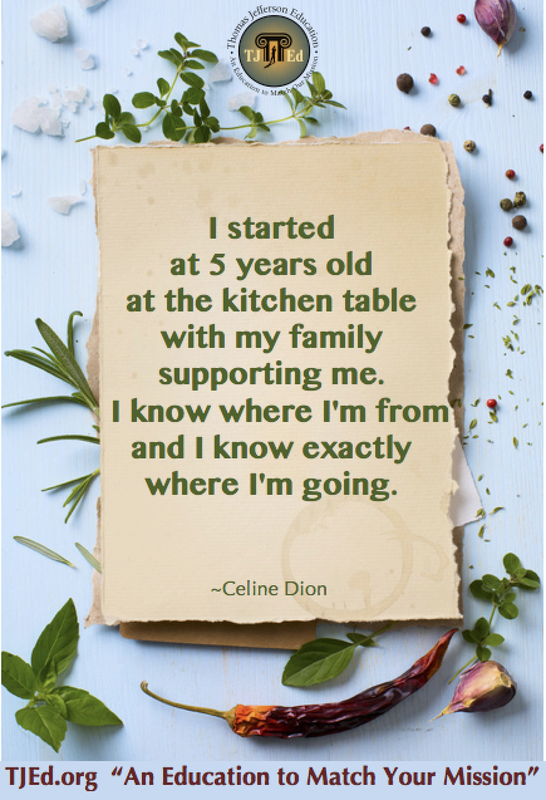 And few places in the world, not to mention in your home, are as perfect for fun and educational conversations as the kitchen! This is a big deal. Yet it is so simple. For homeschoolers, especially parents who help their kids experience classics and mentors, washing dishes never needs to be just washing dishes. It can include an informal discussion about the latest book you’re reading. Or one the young person is reading. It’s amazing how fast dishes seem to get washed when the kitchen is filled with thoughts about Where the Red Fern Grows, Little Britches, or Pride and Prejudice. Time will fly. And learning will increase. Time to prepare lunch, or cook dinner? Add in some Les Miserables music and talk about the themes it covers. Or play a fractions game while you cut up oranges or tomatoes. Laugh. Talk. Discuss. Just talking about learning is incredibly powerful in such an informal setting. Ask your son what his top 3 interests are, and listen to his thoughts and feelings as he ponders and responds. Ask you daughter what her favorite books are, and you’re often in for a wonderful treat. Talking together is a lost art in the modern world of mobile phones, sound systems that take over your cars as you travel, and busy schedules. 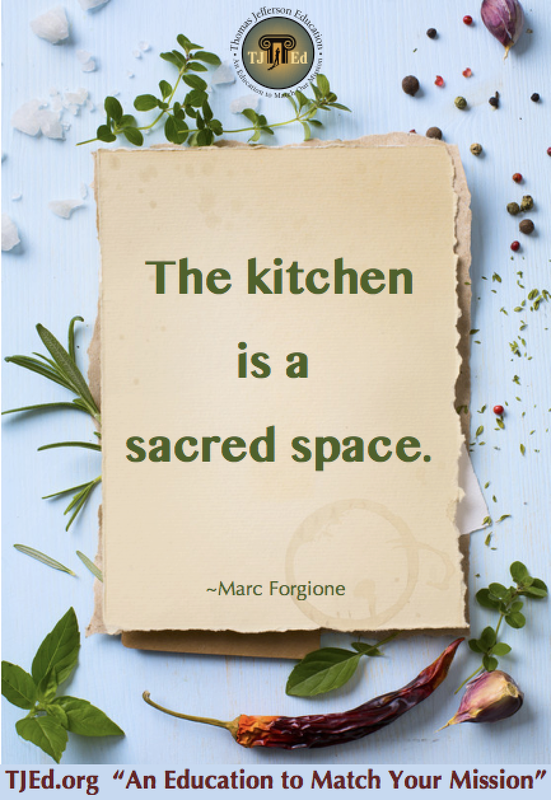 Talk more in the kitchen and during meals. Make it fun. Do it over and over. The kitchen is a fantastic TJEd schoolroom. Just don’t make it formal. Keep things fun, light, informal, and keep doing it. Or, if this feels big to you, just do it today. Try it at lunchtime and again at dinner. See how it goes. You’re going to like it. Or, think of whatever is on your mind from your readings and bring them up. In a series about one of Oliver’s favorite fictional characters, Milo Talon, author Louis L’Amour discusses how the parents always talked at Milo’s dinner table while he was growing up. They discussed all kinds of important things, from books and current events (gleaned from newspapers) to history and stories about various kinds of leaders, inventors and explorers from the past. The children were encouraged to join in, and the discussions were an important way for the parents to inspire, teach, and motivate. The kitchen and dining room are great parts of a quality homeschool learning environment. All it takes is for the parents to look around and start discussing things. Try it. It’s fun. And it will boost and bless the whole family. Your kitchen can greatly improve your homeschool. And it takes less effort than just working silently and trying to convince your kids to finish their chores. Lead out. Set the tone, get it started, and the results will make a truly positive difference in your home. With all that being said about the almost-intangibles of relationships, attitudes, and honest-to-goodness connection with the joys of learning, there are also some really practical academics that are naturally taught in the kitchen; some would say they are taught best in the kitchen! What makes a good recipe work? How does leaving certain things out change it? Why? How do the bubbles form in bread? How can you fix a recipe with too much salt? Why do apples turn brown, and carrots not? What happens in the pan when veggies start to get translucent and caramelize? Why does salt make sweet things taste better? How do you smell the “done-ness” of something? What are all those things in the chicken thigh we’re cutting? Why is it safer to eat uncooked this than uncooked that? How long does this stay fresh, and at what temperature? Why? What changes in a fruit that ripens on the counter? Why don’t all fruit ripen after they’re picked? There’s more laughter (sometimes with full mouths), fun, and conversation in our kitchen and dining area than anywhere else in our lives. My kitchen is my favorite room in our home. Greatness and yumminess happen there. Love this…and so very true. Must try a bit harder to spend more time in the kitchen …. with the boys.